This week we partnered with Wendy Sowa-Maldarelli to co-write an article on the Watchman Device. Wendy is an experienced sonographers with a wealth of knowledge. 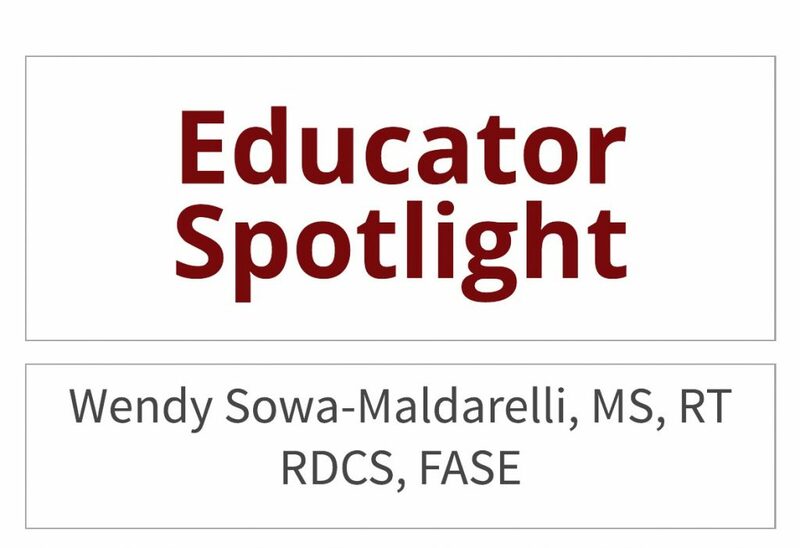 Enjoy learning more about Wendy in this week’s Educator Spotlight interview! After having been in the medical imaging field for quite some time, an opportunity arose to learn ultrasound which was too good to pass up. Though I enjoyed the entire course (including the physics, true! ), something about the cardiovascular system and hemodynamics intrigued me. Spending time in the always exciting cath lab as a rad tech, when cardiac interventions were in their infancy, likely had something to do with it. Upon finishing my ultrasound training, with a specialty in echo, the field was flooded with new grads and finding a job was challenging. At one time, I held four per-diem positions at opposite ends of my county, which was pretty exhausting, but provided a terrific foundation for what was to come. Some of the environments worked in continue to provide interesting stories. At one early workplace, which was also the cardiologist’s home, part of my job was watering the tomato garden, and yes, got some to take home. At another, I had a choice of putting on a small space-heater for warmth or turning on the ultrasound machine. Having tenacity was a plus! What areas of ultrasound do you currently work in? Both echo and vascular offer tremendously diverse areas of growth, spanning clinical to industry, including research, my current field. I am with a multinational CRO (Clinical Research Organization) cardiovascular core lab, and we handle all modalities of imaging (MRI, CT, radiography, ultrasound) for clinical trials in both medical devices and pharmaceuticals. I primarily work with vascular surgeons, a true wealth of knowledge and fabulous colleagues. Previous experience has included imaging informatics with travel, teaching, and specifically in echo, adult, pediatric and adult congenital imaging from a staff positions through service line director for a multi-hospital system. I still retain a per-diem clinical position to not lose the intricate muscle-memory of scanning, as well as keeping in touch with the challenge of imaging ventricular assist devices, valve implants, and newer techniques in correcting congenital malformations as examples. Plus, I love the patients-a day in the hospital centers me. What makes you so passionate about ultrasound? I am truly passionate about the art and science of ultrasound. The science is basically using the ultrasound system tools to optimize images. Patients are not getting any easier to scan, and myriad controls exist to create a study that is interpretable. It is discouraging to encounter students or new sonographers who want to know where that magical ‘perfect image’ button is on the machine. Extensive knowledge of anatomy, physiology, and pathology are absolutes, as is keeping up to date with published guidelines and standards. The art is the patient encounter-a human’s most valuable organ-the heart-is under investigation, and no matter what that patient may say, they are scared. I believe it’s our job to offer kindness, and soothe the figurative heart, as well. Any advice for old or new sonographers? A big thanks to the pioneers I learned from, and continue to encounter. Please stay around and enlighten me; tell me your stories. To new and future sonographers – join an organization, become an ambassador for the field. Write for CardioServ! Keep this miraculous, portable, relatively low-cost, primarily non-invasive technology empowered and valued! It was great working with Wendy on this project. She truly loves ultrasound, the continuous advancement of the technology and its ability to help so many patients. Thank you for your insight and for sharing your knowledge with the ultrasound community. Check out her Watchman article!